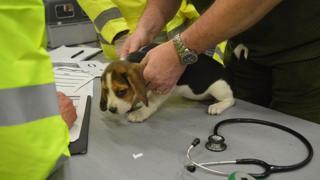 A young beagle called Hugo is the star of a new report highlighting the illegal trade in puppies being smuggled through Welsh ferry ports. The dog was one of nearly 100 rescued in an operation in Holyhead on Anglesey, led by RSPCA Cymru last year. The animal charity said it wanted to use Friday's report to warn the public about the issue ahead of Christmas. The RSPCA said it would prefer people considered adopting rescued animals first rather than buying them. "As we approach the Christmas season, temptation can sometimes lead people to add a cute, young puppy to their household that - in the longer-term - they simply don't want anymore," said Claire Lawson at RSPCA Cymru. "These impulse buys are often not well-researched and can unwittingly fuel the illegal puppy trade." Hugo was discovered hidden on a lorry during a raid in Holyhead port in November 2016. Could Brexit help end puppy smuggling? He was among two consignments of dogs seized during a joint investigation involving the RSPCA, police, Border Agency officials, the Welsh Government, Anglesey council and animal charities in the Republic of Ireland. The puppies included other beagles, basset hounds, labradoodles and pomeranians, aged between six and seven weeks old. RSPCA officials described conditions as "horrendous and filthy", with inadequate food, water and ventilation. One of the puppies died while being smuggled. "If the RSPCA and other agencies hadn't stepped in, Hugo would have been sold to unsuspecting new owners who, inadvertently, would be funding this cruel, murky underground trade," added Ms Lawson. However, there was a happy ending for the smuggled beagle. Hugo was returned to Ireland after health checks where he was eventually adopted by Irish international boxing champion Moira McElligott, who lives in County Carlow. "Hugo was initially adopted by another family, but it didn't work out for him - so we initially decided to foster him and he settled in brilliantly," she said. "He means the world to us both, we're so delighted to have adopted him, and that he, along with 95 others, was rescued from such an appalling start to life."